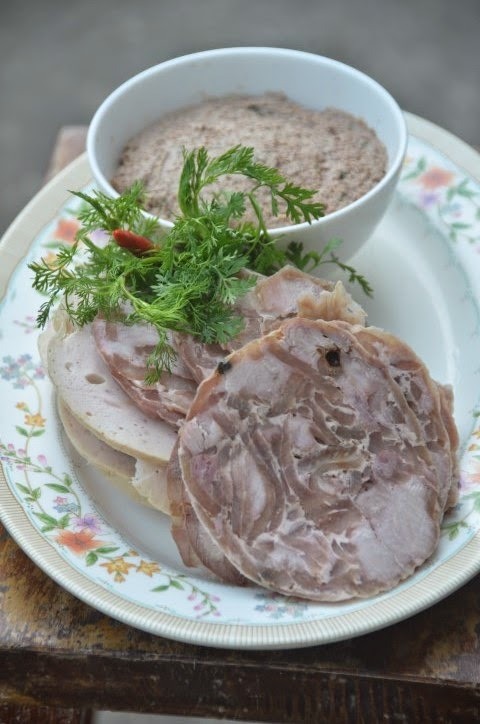 These cold cuts known as thịt nguội in Vietnamese is a popular item at banquets, Tet (Vietnamese New Year) and other special occasions. 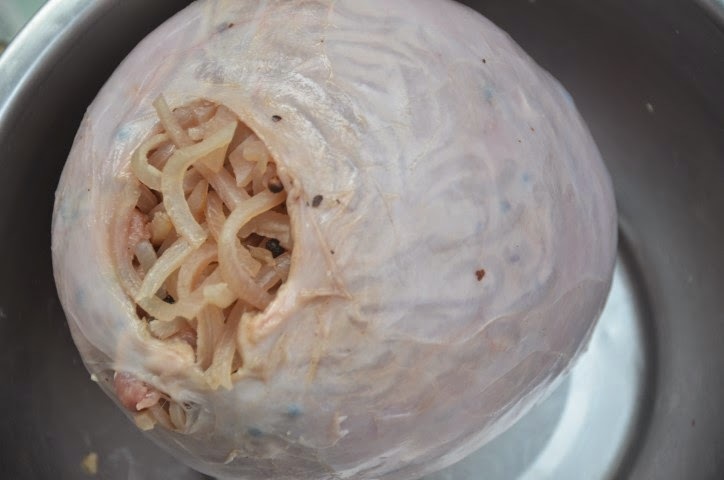 Here in the region of Soctrang and the surrounding villages it is made from pork meat, pork skin, seasonings and is then typically stuffed into a pig's bladder. It is a bit time consuming to make this. When you buy these items the skin may still have a lot of hair so you will need to use a tweezers and pull these out. Some people scrape the hair off the skin but you may still have little pieces of hair inside the skin which I find unappetizing. All the fat needs to be removed and then the entire skin surface needs to be scraped clean. 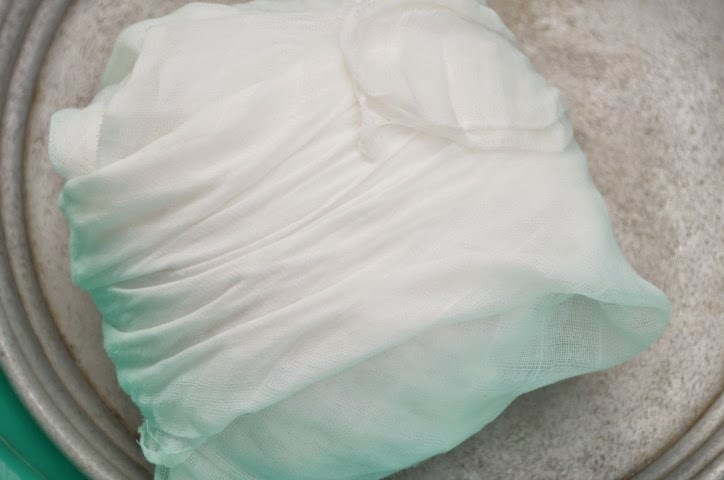 The bladder needs to be scraped clean (inside and outside), extra fatty tissue removed and washed in salt and vinegar before it can be used. The bladder may appear small but after it has been pounded a little it can expand and stretch quite a bit. I was surprised myself since I did not think that I could stuff over 3 pounds of ingredients in such a small organ! If you do not have access to pig's bladders you may use either pig's stomach or pig's leg. 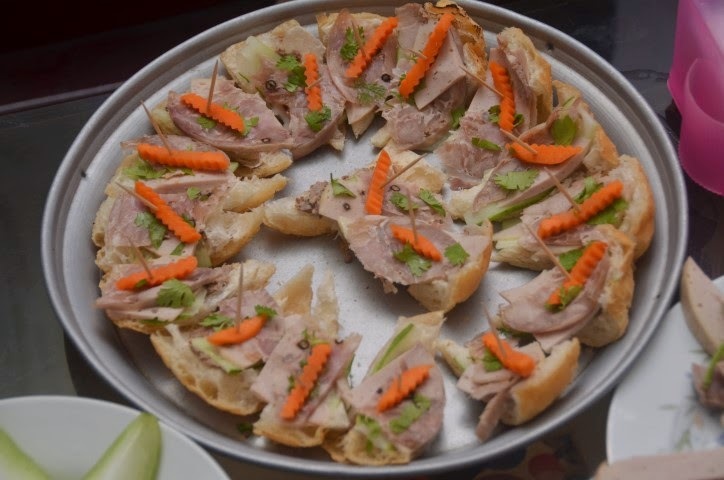 My aunt (by marriage) tells me her father used to make this with the pig's leg. He skillfully and carefully removed the skin but left the toe nails in so it would look pretty. If you are using the stomach be sure to properly clean it extremely well before using. Please refrain from using it if you are unsure on how to properly clean it. Some people prefer to make this cold cuts by adding a little Chinese 5-spice. However, many of my relatives are not too fond of the strong taste so we leave this out. Ngau Y (maternal fifth aunt living in California) makes this by adding a few extra ingredients such as pig's ears and snout. If you use these items then make sure these are extremely clean. Like the pig's skin you do need to partially cook these ingredients before adding to your choice of casing. now this is one full bladder! 1) In a large container (enough for all the ingredients and a little extra room for mixing them) add meat, skin, curing salt, liquor, salt, sugar, and whole peppercorns. Mix the ingredients well. Refrigerate for about 20 minutes to marinade. 2) Stuff the bladder with the ingredients but try to have an even mix. This way when you cut the cooked stuffed bladder you will have a nice mixture of ingredients. 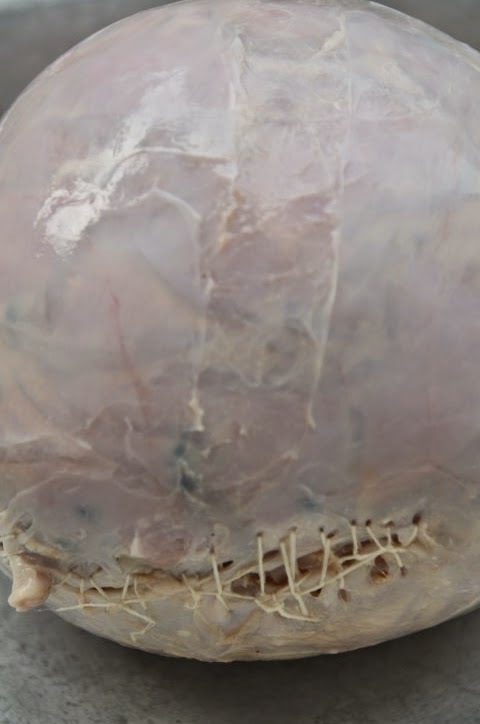 3) Use a needle and thread and carefully sew the bladder opening to seal. 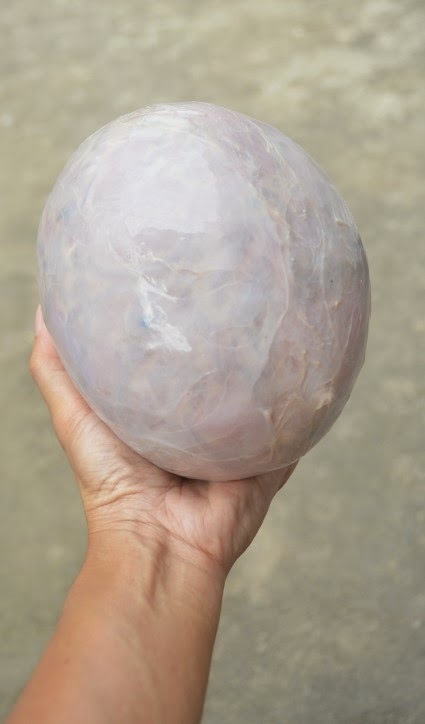 Try to shape the bladder to a round ball or oval shape (depending on your preference). 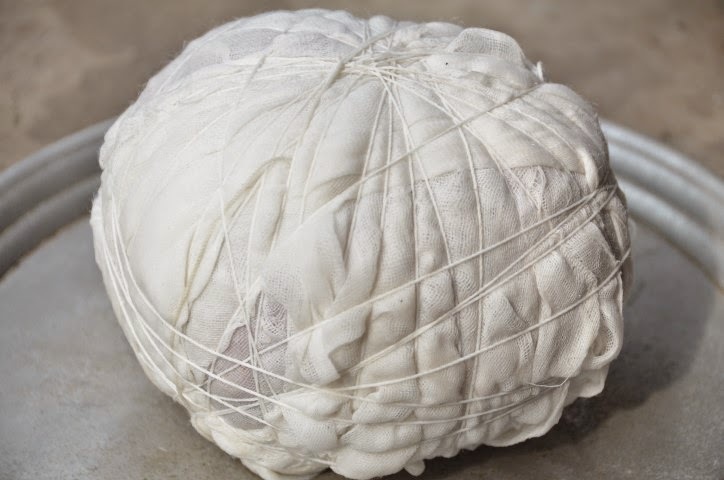 4) Wrap the bladder with a cheese cloth and use the string to tie it securely. 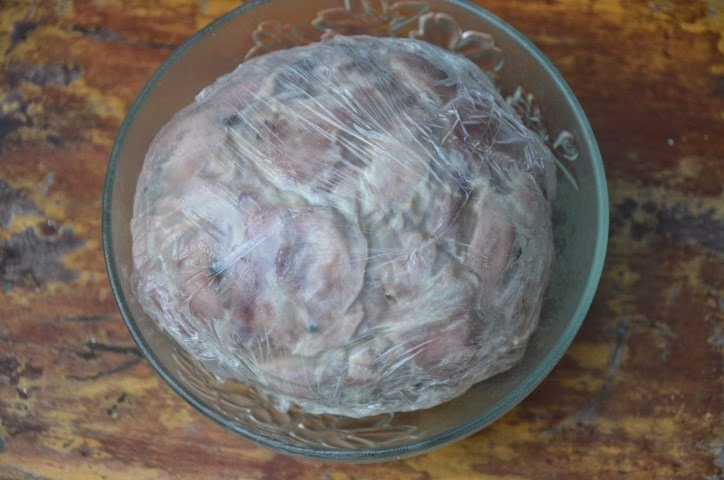 5) Carefully drop the wrapped and tied bladder in gently boiling water, cover and cook for about 2 hours. After half way done cooking (after one hour) use a sharp skewer and poke about 5-7 holes into different parts of the bladder. Be sure to turn the bladder to the other side to complete the cooking. 6) Remove after cooking and let it cool down. Once cooled cut the strings and unwrap. You may slice or cut into strips (like French fries) what you want to eat after it has cooled or keep it whole in the refrigerate. 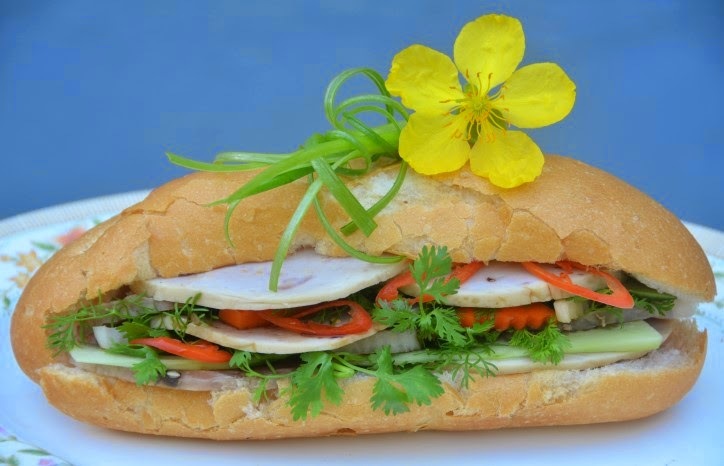 ***Sodium nitrite (or muối diêm in Vietnamese) has 6.25% nitrite. It is used to cure meat and acts as an antimicrobial agent. Here is more info on "What is the difference between Sodium Nitrite and Sodium Nitrate?" You may omit the sodium nitrite if you intend to eat this cold cuts right away. May store the cooked meat in the refrigerator for up to 1 week. **When you make this you may season it according to your taste. I prefer to make this with just a little salt since I can always use a dipping sauce if interested later. I find that if I make it too salty not everyone can eat it due to taste or health reasons. 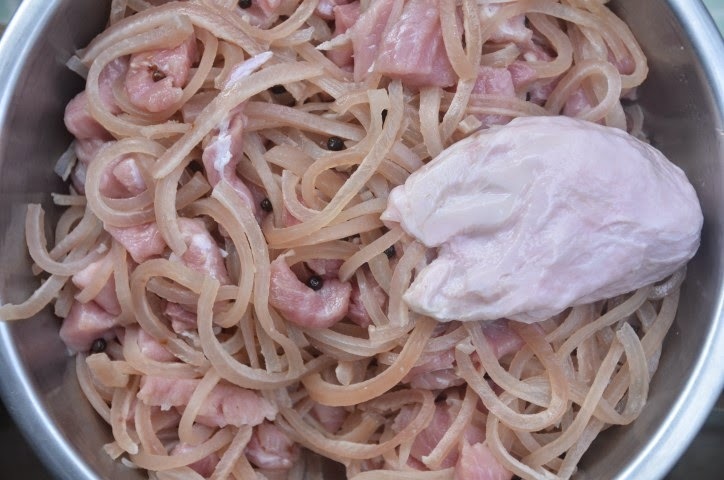 *If you are using metric measurement you may use 1 kiloggram of pork and 500 gram of pork skin for this recipe. When you purchase the bladder be sure to let your vendor know how much of the main ingredients (pork and skin) you are planning to stuff it. The bladders do come in various sizes. You can adjust the meat and skin portions. Some people like it more chewy so they put in more skin. Try not to overcook the skin. After 15 or 20 minutes of cooking you can take a piece out and either chew it or take a fork and pierce it to check for the softness. What you do not want to do is cook it until it has become very soft or mushy. 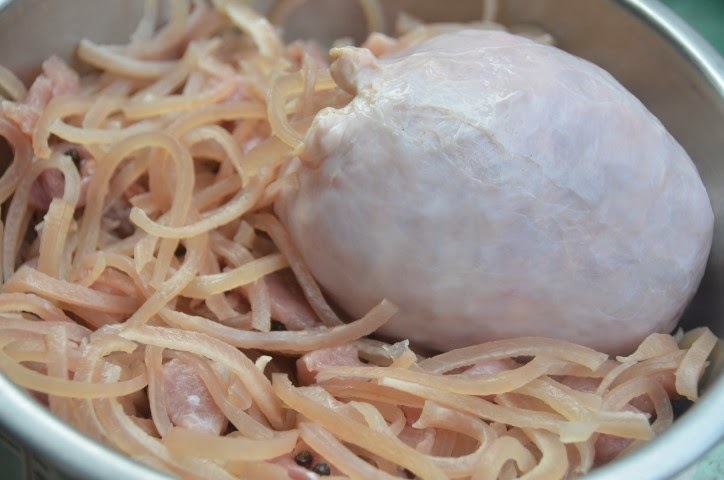 *I blanched the skin to help softens it a little in order for me to easily pull the hair out. I then scrape the skin with a knife to clean it. Si Y (my maternal fourth aunt) tells me she cooked the skin first before pulling out the hair with tweezers. *Si Y tells me she grinds the pig skin instead of cutting them into thin strips. She marinades fried garlic, some roasted partially crushed black pepper, some roasted whole peppercorns, pork cubes, ground pork skin, salt, sugar, MSG, soy sauce, and some rice wine (that has been steeping in star anise for at least a week). 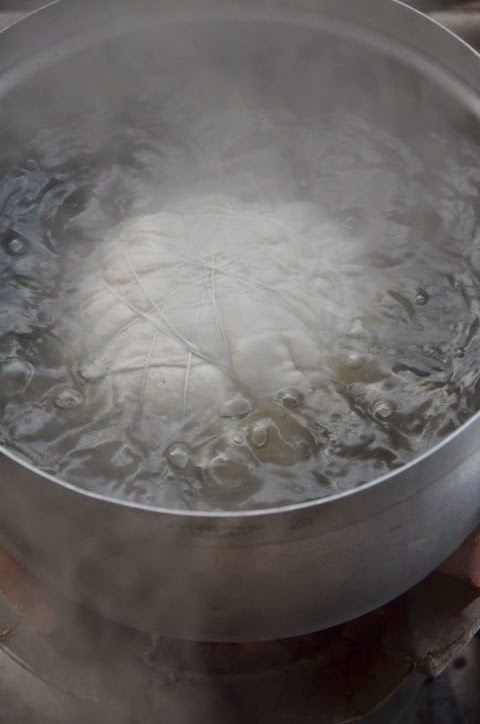 She steams the stuffed bladder for 2 hours instead of boiling since this retain the moisture making the final product sweeter. I had a taste of her cold cuts and it was delicious. I particularly like the partially crushed black peppers and the extra flavor from the anise steeped wine. *If the bladder opening is too small to turn it inside out to clean you may slice it open a little wider. Do not make a big slice since you do need to sew this part later! *You may add Chinese 5-spice, pig's snout and ears if interested. Although adding cooked ears can give this an interesting texture. However, I don't know about using the snout. *This took a bit of work but the final result is very tasty (my opinion). I am not quite sure if you can find animal's bladder for sale in the United States.